In furtherance of its mission, the Clay Mathematics Institute funds and organizes summer schools, conferences and workshops, in some cases in partnership with organizations; it employs Research Fellows, Senior Scholars, and Research Scholars; and makes annual Research Awards to recognize major breakthroughs in mathematical research. CMI and its partners also run programs to encourage gifted students to pursue mathematical careers. It has also posed the Millennium Prize Problems. 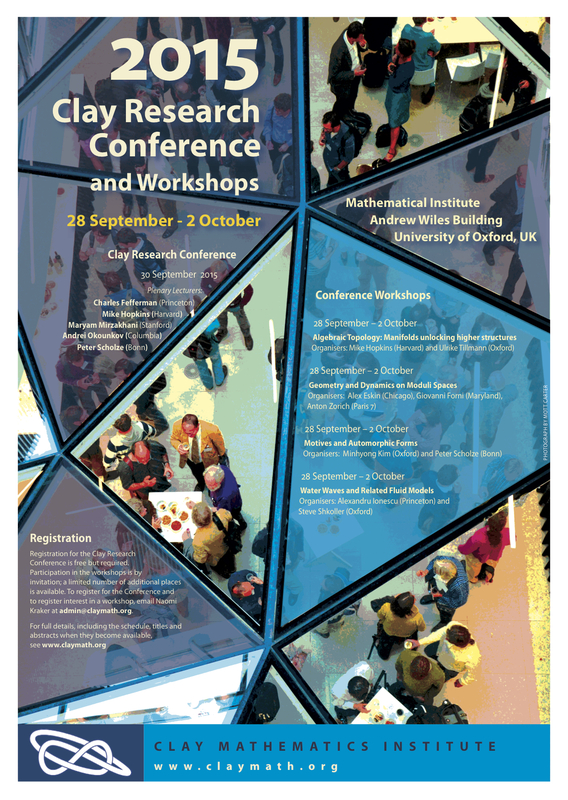 The annual Clay Research Conference is an opportunity for leading mathematicians to speak about significant recent research to a general mathematical audience. It is the occasion on which the Clay Research Awards are presented. The CMI summer schools are instructional conferences whose aim is to furnish a new generation of mathematicians with the knowledge and tools they need to successfully work in an active and important area of mathematics. The CMI and the London Mathematical Society run a series of week-long Research Schools for graduate students and young researchers. The CMI conducts a program of small workshops, which are held at the Mathematical Institute in Oxford. Typically, full funding for 10-20 people is available for each workshop, but others may be invited. As part of its mission to encourage talented students to pursue mathematical careers, the CMI partners with the established outreach program PROMYS and PROMYS Europe. Clay Research Fellows are selected for their research achievements and their potential to become leaders in research mathematics. All are recent Ph.D.'s, and most are selected as they complete their thesis work. Terms range from one to five years, with most given in the upper range of this interval. Fellows are employed by the Clay Mathematics Institute, which is a U.S. charitable foundation, but may hold their fellowships anywhere in the U.S.A., Europe, or elsewhere in the world. The fellowships provide generous salary and research expenses. The aim of the Senior Scholar Program is to foster mathematical research and the exchange of ideas by providing support for senior mathematicians who will play a leading role as "senior scientist" in a topical program at an institute or university. Senior Scholars will be in residence for a substantial fraction of the program and are expected to interact extensively with the other participants. Terms of appointment generally range from one to three months, although terms of up to six months are possible in exceptional circumstances. Shorter appointments of one to two weeks duration can be made as Senior Visitors. Clay Research Scholars are supported on research projects of up to one year. This program is not intended to support regular research visits or routine collaborations, but rather to allow the CMI to respond quickly and flexibly to exceptional circumstances in a way that other funding bodies are sometimes unable to do. Enquiries about proposals should be sent to the President. The Clay Mathematics Institute presents the Clay Research Award annually to recognize major breakthroughs in mathematical research. The awards are made on the recommendation of the Scientific Advisory Board. There is no general call for nominations. The Clay Award for Dissemination of Mathematical Knowledge is made in recognition of personal contributions to research in mathematics at the highest level as well as of distinction in explaining recent advances to the public at large. It is presented after a public lecture by the recipient.